If Diaz is used intelligently and the Mets are mindful of his health, there's no reason he can't be deployed in special situations. 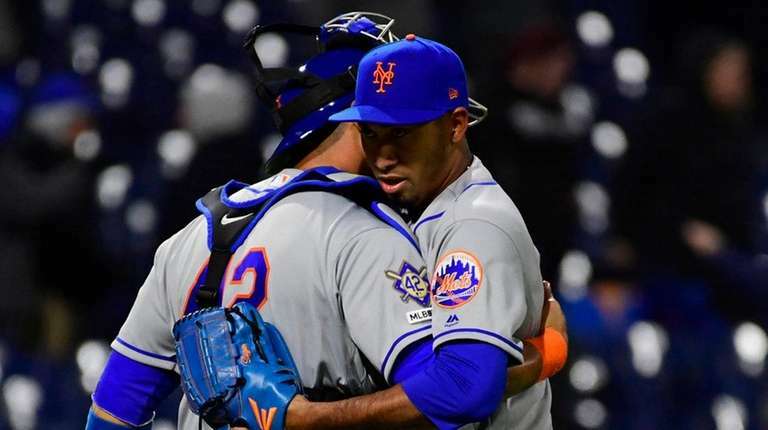 PHILADELPHIA — For one night, it probably doesn’t matter all that much that the Mets needed 11 innings Monday to beat the Phillies when nine should have sufficed, recording a 7-6 victory that took an excruciating 4 hours and 29 minutes to complete at Citizens Bank Park. But how the Mets got to the finish line in this mid-April game is a bit more confounding in the big picture. There are 146 games left, and Mickey Callaway appears to be operating by a book that, over time, has more potential for head-scratching losses than consistent winning. Of course, it’s not just Callaway. Shortly after he spent more than 10 minutes being grilled on his bullpen usage — primarily Edwin Diaz’s inflexible three-out leash — Brodie Van Wagenen stepped up to defend his manager. This was a highly unusual event. It’s typically a very rare occurrence for a general manager to hold court with the media in the clubhouse after a game — especially a win. That’s more for serious injuries, a roster move or maybe to chime in about a controversial umpiring decision. Otherwise, it’s the manager’s show. But at some point, there must have been a debriefing between the two, prompting Van Wagenen to speak on the matter. The primary issue was Callaway’s statement that Diaz, one of the game’s elite closers, is going to be used for only three outs. End of story. The question came up because Callaway had the perfect opportunity to call on Diaz to rescue a totally ineffective Jeurys Familia with two outs in the eighth. The Mets were clinging to a 6-5 lead but the bases were loaded, and Diaz was undeniably the best bullpen weapon available. Getting four outs hardly is a Herculean feat for a closer, but Callaway didn’t even consider him. He went with Robert Gsellman and was rewarded with a four-pitch walk to Jean Segura that tied the score. As maddening as that sequence was for Mets fans, Callaway was unapologetic afterward. Truth is, he would do it again, and will continue to do so, according to the Mets’ policy regarding Diaz. The closer is only 25 years old, not 35. Saving bullets is one thing. But if Diaz is used intelligently and the Mets are mindful of his health, there’s no reason he can’t be deployed in special situations like this one — against a key NL East rival early in the year. But that’s a problem, too. Faith isn’t enough, and regardless of how well these relievers are supposed to pitch, they’ve been badly underperforming. But if Diaz can’t be used in the most crucial spots late in games, that’s an issue, particularly when Familia — Callaway’s rubber-stamped eighth-inning guy — looks lost. The Mets’ bullpen entered Monday with a 7.46 ERA for this month, and Familia had an 11.25 ERA in his previous four appearances. Here’s how his eighth inning went: single, walk, miracle double-play grounder (106.5 mph exit velo), walk, walk. If not for Jeff McNeil’s brilliant diving stop, the Mets would have lost this game, and deservedly so because of Familia. The fact that Diaz actually wound up getting the save opportunity three innings later was surprising, to say the least. Callaway lauded Gsellman for straightening himself out (better late than never!) and Luis Avilan, who struck out Segura with runners at second and third in the 10th. Then, finally, Diaz got the ball. For three outs. That plan wasn’t the reason for the Mets’ victory Monday night. As far as the bullpen is concerned, they got lucky. And with the Phillies’ powerful lineup, they’re not going to get many second and third chances, as they did in this series opener. It’s why teams use their best relievers in the highest-leverage spots. Relievers such as Diaz, who everyone now knows won’t be used in them if that spot requires four outs.